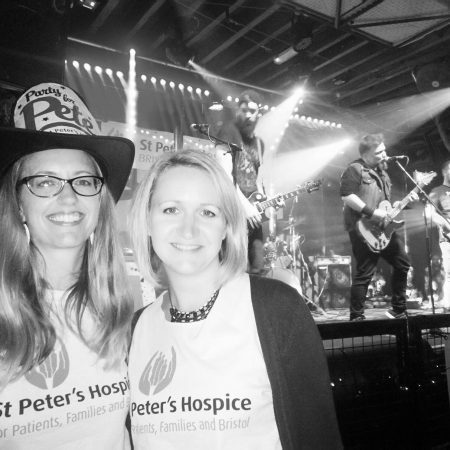 After a fruitful fundraising period of five years – a time in which eight previous gigs have featured 65 musical acts and raised an outstanding £15,000 for St Peter’s Hospice – Party for Pete returned to The Fleece for its ninth and very last feel good celebration of charity and live music. With all performers generously giving their time for free, a something-for-everyone ethos could barely have been better represented with singing troubadours, acapella sea-shanties, indie rock and heavy metal. This year there’s even the Teutonic promise of tight leather and even tighter spandex in the form of glam metal all the way from Germany. Another solo performer Ben Pang provides an enjoyable set of bluesy acoustic folk. Chord changes during ‘Sands of Time’ contain echoes of ‘Black Magic Woman’ while his husky Springsteen-esque vocals are perfectly suited for the crisp, hammer-on blues of ‘Seven Seas.’ A couple of his tunes feature the never unsatisfying instrumental duet of harmonica and strummed guitar while ‘Spoken in Verse’ nicely captures a tinge of Paul Weller’s ‘Above The Clouds’ romanticism. A boisterous count in sees the day’s programme take a slight change of tempo as The Kelly Line launch purposefully into their set. 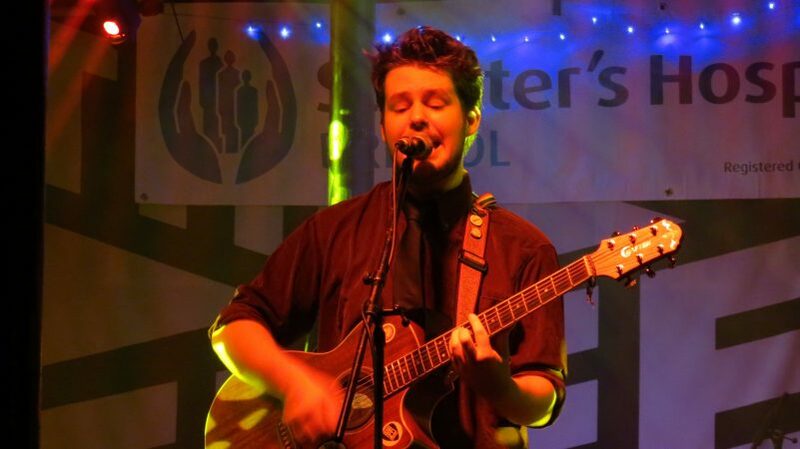 Though normally existing as a duo comprise of father Mike and his son Ben, its just the latter who appears on stage with a bandmate on harmonica. Seemingly there’s a stylistic tinge of 90s U.S punk but, in that they are delivered via acoustic guitar and some charmingly jaunty harmonica breaks, they’re given a pleasant twist. The world-weary sentiments of ‘Blind Obedience’ and ‘Hamster’s Wheel’ – which previously sat a little askew on Ben’s young shoulders – are provided a more accepting context when his father is revealed as the group’s lyricist. After late calls for a replacement for Frequency Cowboy went out to multiple acts, the unexpected just-turn-up-on-the-day approach of singer/guitarist Dan Milton sees the intended line up of eleven acts increased to twelve. Squeezed into a four song set, Milton is a nice addition to the event; with a large voice and acoustic guitar, he delivers a cover of The Stereophonics’ ‘Dakota’ and The Coral’s epic ‘Dreaming of You.’ He also seems to have brought along his young family – two girls, presumably his two daughters, bellow heckles of fondness and boogie along to their daddy’s tunes. After first appearing at a Party For Pete gig at the incredibly callow age of 10 years old, Alannah Jackson is still a young teenager and, amongst a few cover songs – Dolly Parton’s ‘Jolene’, Eddie Vedder’s ‘Elderly Woman Behind The Counter in a Small Town’ and ‘Disarm’ by The Smashing Pumpkins – Jackson has grown into a songwriter in her own right and she showcases several original tunes.’Waiting’ and ‘Lose Control’ reveal the promise of a maturing songwriter. In what is later reveal to by a heavy metal-centric second half of the line up, the first signs of a significant increase in volume appear in the form of Some Villains. The trusty rock n roll staple of two guitars, drums and bass has now invaded the stage as the Somerset noise-rock quartet offer screeching guitar licks, an impressively dextrous bass player and some Thin Lizzy-esque duel guitar soloing. ‘Ghosts in the Field’ is a standout tune while later some intra-band jibes allude to the drummer having strayed out of time. Waved Albatross have enticed an army of fledgling fans to join in the fundraising celebrations as the Fleece starts to fill up. Featuring immediate melodies, quirky rhythms and some sunshine guitar riffs, the young band could well be the day’s most impressive act. 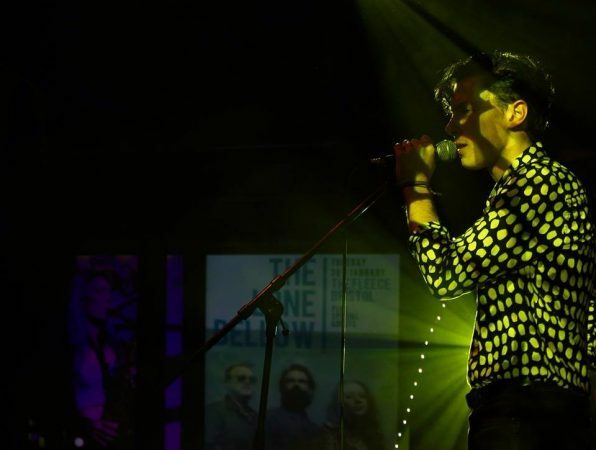 The lead singer also appears a nascent star in waiting – he occasionally delivers a languid croon ala Ian Curtis and, during the heavier but still melodic ‘Pleasure’ incites cries of audience adulation via the simple act of sporting a crowd member’s shades. Boom! And The Tiny Explosions then become the evening’s hitherto loudest band with a punchy set of head nodding rock numbers. Capturing that Nirvana-like ability to make a trio sound like a band twice its size, there’s a wall of weighty riffs and a blistering guitar solos. The introduction to ‘Just Behind You’ offers the opportunity for the band’s drummer to confuse an audience member while there’s the incongruous sight of some of Waved Albatross’ fans ballroom dancing along to the head-pounding heavy rock riffage. On an evening whereby spandex-laden, German glam metal rockers Night Laser are second on the bill, it perhaps says a lot about the uniqueness of enduring Party for Pete supporters The Longest Johns remain the day’s most novel act. A five piece harmony group who sing acapella sea-shanties certainly cannot be described as ten-a-penny. A song called ‘Barge Ballad’ gives a lyrical account of the barges on the Thames and the quintet over up such authentic nautical tales that one can almost feel the onset of scurvy. With heavy riffs and a general concession to melody at their song’s choruses, the flamboyantly dressed Pixie Encore occupy a sonic space somewhere between metal and indie pop. The group’s bass player is instantly noticeable as a standout musician – and not just for his 70s footballer haircut and cumbersome leopard print jacket. “Falling’ sees some dynamic slap bass and generally it’s a fine display of frenetic, octave-spanning bass guitar. Written about a bad luck holiday in Ibiza, ‘Fire’ sounds, charmingly, like an outtake from 2003 film School of Rock. Then it’s amps-up-to-eleven for the remainder of the night; leading a final trio of heavy rock acts, Grey Wolves Grin are full of lung-bursting, guitar shredding energy. The band’s rangy guitarist wields his Les Paul while adopting a purposeful power stance and just when one assumes that the band are suitably loud enough, the singer intros their fourth track with “this one’s a little bit heavier.” There’s a subsequent breakdown as the band’s drums are rendered inaudible beneath the machine gun riffs and chunky five string bass. Before the clamorous finale of Kikamora, tradition is upheld as Sarah Smither announces the night’s fundraising total and raises a glass to her late husband James who was cared for by the hospice in the last weeks of his life. The evening’s total is announced as £1,000 (it now stands at £1,400) and, incredibly, Sarah’s Party for Pete Gigs have raised over £16,000 while the total raised in James’ memory now exceeds £40,000. Then, amongst a full frontal assault of headbanging, Flying V guitars and a stray microphone stand, Kikamora assure an emphatic swansong to Party For Pete’s inspiring five year tenure. You can still get involved and donate by visiting the Party for Pete JustGiving page. Tagged alannah jackson, ben pang, boom! and the tiny explosions, dan milton, grey wolves grin, kikamora, night laser, party for pete, pixie encore, review, scott hammond, some villians, the fleece, the kelly line, the longest johns, tristen exon, waved albatross. Bookmark the permalink.